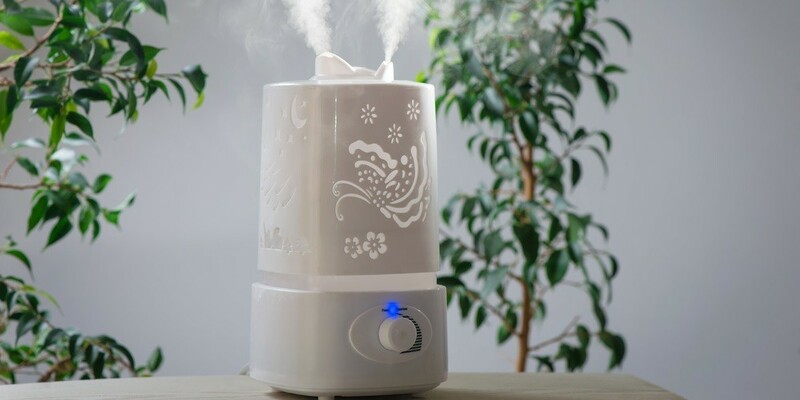 Home » FAQs » Pros and Cons of Different Types of Portable (or Room) Humidifiers? What Are the Pros and Cons of Different Types of Room Humidifiers? There are five general categories of portable room humidifiers available: cool mist, ultrasonic, evaporative, warm mist, and vaporizers. Each type offers pros and cons for users – evaluate the qualities of each to determine which best meets the needs of your family and home. Cool mist humidifiers emit a cool vapor to add moisture to the air. They utilize a filter that captures water impurities and are easy to clean. These humidifiers are ideal for use during warmer weather and in areas that experience a warmer climate. An ultrasonic humidifier employs a metallic diaphragm that vibrates at high frequencies to create water droplets that are added to the air. They use very little energy and have no operating noise, so they are great to use overnight and in areas where you don’t want to increase noise. An evaporative humidifier operates much like a cool mist evaporator – it does not heat water to create humidity. It is a wick humidifier that uses a fan to circulate humidity. Because they do not generate heat, they are ideal for homes with children and pets. Warm mist humidifiers are often used to treat colds and the flu during colder months. They heat water to create vapor, which is cooled prior to being released. These systems are less likely to experience bacterial contamination because water is heated. A vaporizer may be either warm mist or cool mist. Inhalants can be added, making them a common choice to treat colds and the flue. They are typically quite affordable, making them a great choice for all budgets. How can I set my humidifier’s display on dimmer mode?